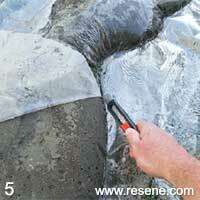 Mark Rayner shows how to mould a concrete ornament. You will need: A bucket, trowel, clean water, craft knife, coloured glass pebbles, paintbrush, pins, a metal reinforcing rod, ready-mix concrete, ready-mix mortar, sewing machine with strong thread, felt-tip marker and two large pieces of thick plastic sheeting. Resene Concrete Stain tinted to Resene Black. Other ideas: Make your own forms and objects with this technique and consider different ways to finish them – maybe with a mosaic of ceramic tile or crockery pieces, or with shells, plaster cement, stones or paint. If glue is needed, use exterior, cement-based, tile adhesive and leave it to dry overnight before standing your work upright. 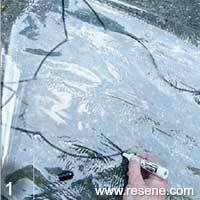 Using the marker pen, draw an outline of a large cat shape on one of the pieces of plastic sheeting. 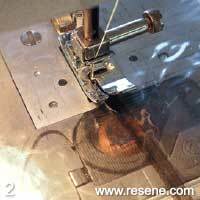 Pin the two pieces of plastic sheeting together and sew along the cat’s outline, leaving the bottom edge open. Remove the pins. Mix the concrete to a fairly wet consistency. Push it into the cat mould, starting at the ears, as shown. Continue until the mould is almost full. Next, insert the reinforcing rod up through the figure from the base, ensuring it goes up through the neck. 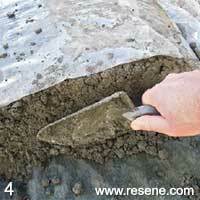 Mix a slightly drier concrete mix and fill the base of the mould, as shown, levelling off with the trowel. 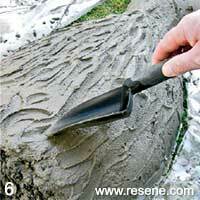 Leave the concrete to dry overnight and remove the top layer of the mould with a craft knife. 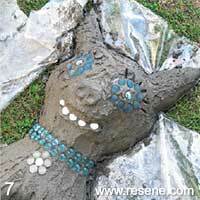 Mix the mortar into a fairly wet consistency and apply a generous layer to the front of the cat, as shown. Build up the facial detail and mark the fur with the tip of the trowel. 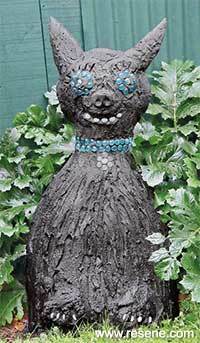 Press glass pebbles into the wet mortar mix to make the facial details, collar and claws. 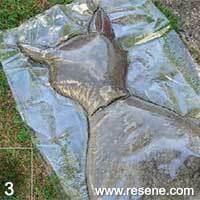 Leave the sculpture to dry for 48 hours before placing in its final position in a garden border. 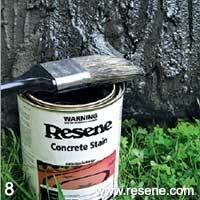 After 28 days, once the concrete has fully cured, apply two coats of Resene Concrete Stain Black to the cat, allowing four hours for each coat to dry.